After a solid night of much needed rest, we picked up a compact Chevy Cruze, masquerading as a midsize vehicle in Driving Force's fleet of rental cars. With no other options, we were happy to find it quite serviceable, even including a back-up camera, heated seats (not real critical this week), and stellar fuel efficiency (40+ mpg). And the local rental agent did offer pick-up service from the hotel this morning. Though it has logged 38,317 miles, we were a little surprised to find the car so dinged up. Even the windshield had numerous small cracks from rock strikes. "It doesn't take long up here," agent Rebecca explained. Many area roads are unpaved, and in the summer sections of the few major road revert to gravel as repairs try to keep up with the damage inflicted by winter's extreme freeze/thaw cycles. 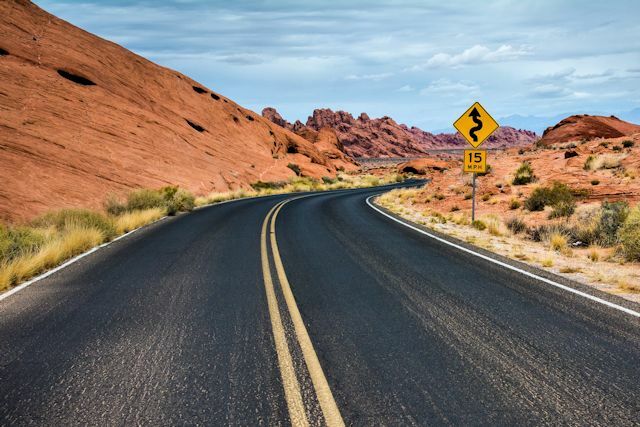 To protect their vehicles from flying rocks thrown up from gravel roads, some drivers have installed plastic headlight covers, wire radiator grills, and even rubber matting under the gas tank. Since we were moving to a self-catering cottage twenty miles out of Whitehorse for the next two nights, our first order of business after we checked out of the hotel was grocery shopping. The local Real Canadian Superstore provided an excellent variety, even including vegetarian and gluten-free sections, at prices that ensured a good value. 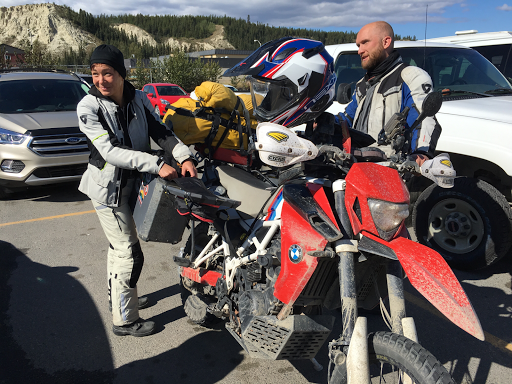 As we were loading the groceries into the car, we couldn't help noticing a mud-splattered BMW motorcycle parked next to us. Standing beside it, lunching on a baguette and some cheese, were Thomas and Helena, a German couple in their thirties on a great adventure. They arrived in Calgary four weeks ago thanks to Air Canada's "Fly Your Bike" program offering reduced rates for shipping motorbikes during the summer months. The bike can even fly on the same flight as its owner. Now that's attention to tourism detail. These road warriors know how to pack light. But back to Thomas and Helena. They left Calgary and rode 2,500 miles to Prudhoe Bay on Alaska's northern coast. More than 1,100 miles later, they came through Whitehorse today on their way south. And we do mean south. By the end of this year, they plan to have ridden another 15,000 miles to wind up their epic road trip in Buenos Aires. Both these adventurers were quite personable and their English was flawless with only a scant trace of an accent. (Another reminder of the American education system's abject neglect in failing to teach our children a foreign language.) We wished them well and parted ways, with them headed to Watson Lake another 272 miles away, whereas our Fish Lake destination was a bit closer. On the way to Fish Lake, we stopped at a small pond for a picnic lunch. As we enjoyed our sandwiches, fish in the pond entertained us with their own version of Olympic high jumps...with no bar to clear but a smorgasbord of insects to lunge for. So actually, you could say we and the fish had lunch together, all under the shelter of a brilliant azure sky scattered with cotton puff clouds. 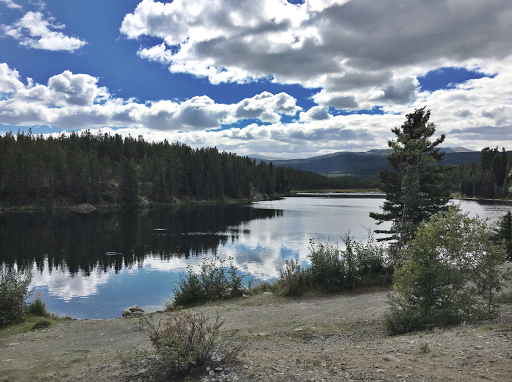 After this lovely scene, Fish Lake was a bit anti-climactic, particularly after the rave review we had heard from the car rental agent. 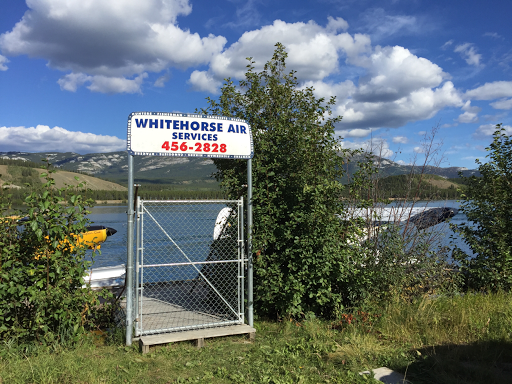 It was time for us to return to town and check out some of downtown Whitehorse. 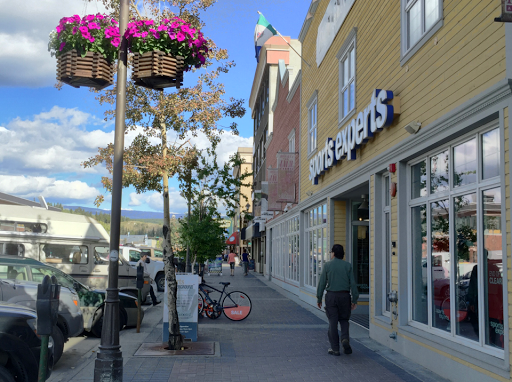 Covering just a few square blocks near the Yukon River, the compact city center is very walkable. 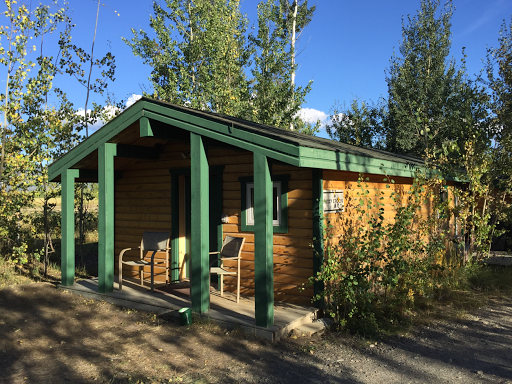 We started at the Yukon Visitor Information Center, which offered convenient and free parking as well as providing guidance. While there we picked up a Yukon Gold Explorer's Passport, brainchild of the Ministry of Tourism and Culture. As one might expect, the document is used to collect stamps from a plethora of museums, cultural centers, historic sites and similar attractions throughout the Yukon. As added motivation, the ministry is running a contest this summer. 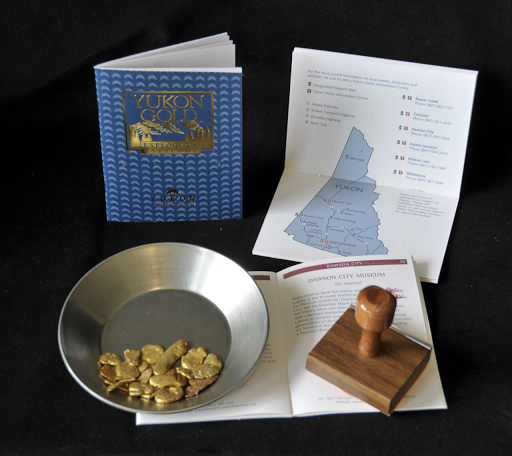 Those who obtain a twenty or more stamps will be entered in a drawing for a chunk of real Klondike gold. Main Street features one recreation outfitter after another. We continued our stroll along the tidy streets lined with restaurants and shops, hotels and galleries. 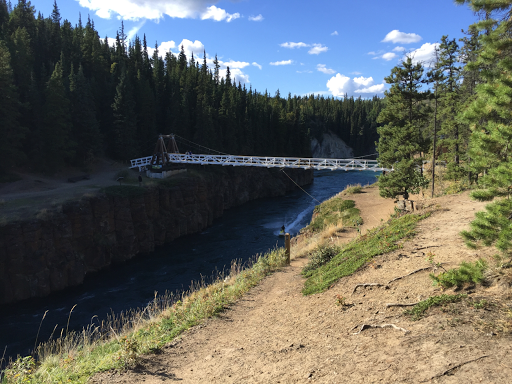 Thanks to the traffic brought to town by the Alaska Highway and very successful refocusing efforts by its people, Yukon has transformed itself from a mining economy into a thriving tourist destination. With such a tiny population, however, the territory does not have the economic means to sustain itself without subsidies from the federal government. 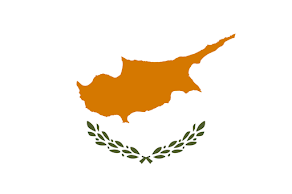 Thus, provincial status is not likely to be in its future. The bright and spacious entranceway to the "Ledge." This last bit we learned from John, a Filipino transplant and territorial government employee who gave us a guided tour of the legislative assembly and government administration building, which opened in 1976. 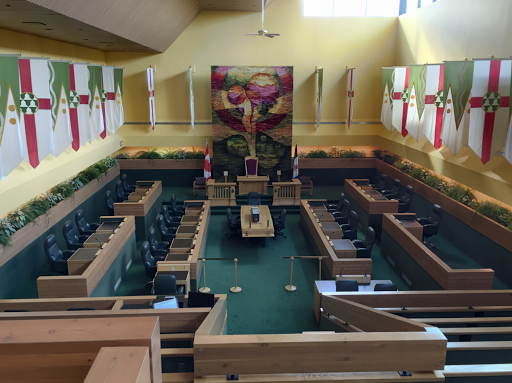 Highlights were the legislative chamber, where the 19 members of the assembly gather to enact laws governing the territory, and the members lounge with its exhibit of the Women's Tapestries. 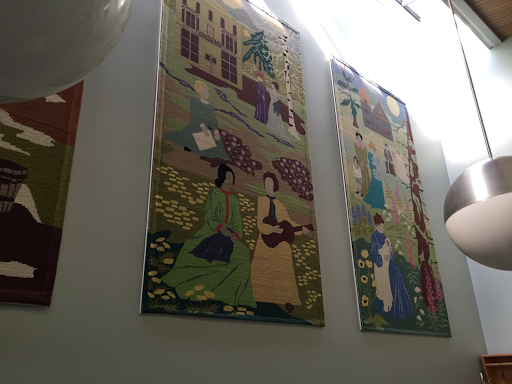 Designed in honor of International Women's Year in 1976, the five tapestries were created by more than 3,500 Yukon men, women and children volunteers, nearly one-fourth of the population at the time. Though it was after 5:00 when we left the "Ledge," as Canadians call their legislative buildings, the forecast called for almost five more hours of daylight, so we turned south out of Whitehorse to visit Miles Canyon. 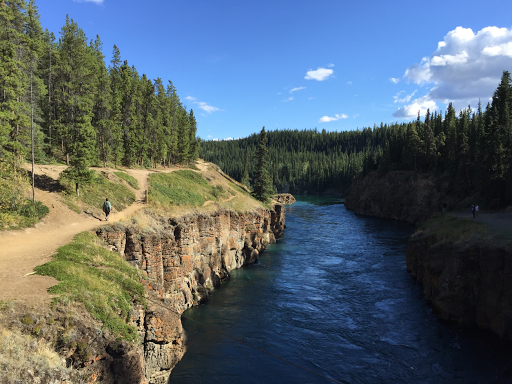 When the Yukon River was forced through the narrow canyon in pre-hydroelectric days, it churned up into the powerful White Horse Rapids. So ferocious were the rapids that hundreds of boatloads of precious cargo were pulled under by them during the Klondike Gold Rush. Today the water moves through more serenely. A pedestrian suspension bridge built in 1922 spans the canyon. This beautiful scene was a stellar location for one of our "Love This Spot" letterboxes, but after crossing and recrossing the bridge and exploring the trails near both ends, we were unable to locate a suitable hiding place. A half-hour drive took us to Sundog Retreat and our cozy cabin for the next two nights, Fuzzy Crocus. 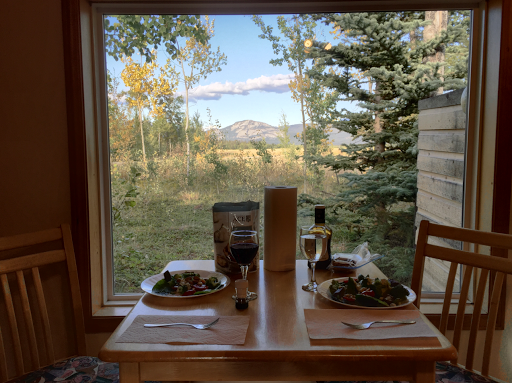 With a full kitchen and a well framed view of its scenic surroundings next to the dining table, we made good use of our grocery run and enjoyed a relaxing dinner. Far away from the lights of the city, we were cautiously optimistic about seeing some aurora activity from the cabin tonight. Solar conditions were favorable and visible activity was likely from Dawson City to Watson Lake. But rain was also in the forecast, and the clouds that would bring the rain moved in around midnight and obscured any lights that might have been dancing. We'll certainly have other opportunities with three more nights in Whitehorse and again in Yellowknife and Iqaluit. And there's always Alaska. 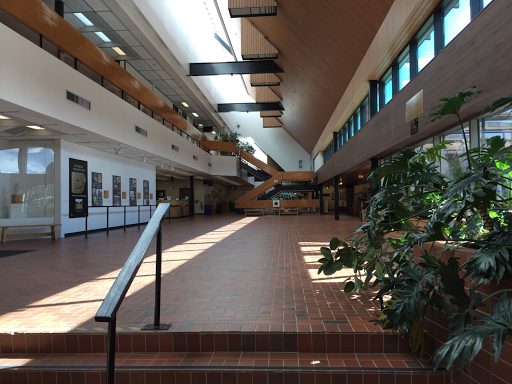 Tomorrow is expected to bring rain, so we plan to explore some of Whitehorse's many museums. Clever Shop of the Day: Due North, on Front Street, selling maternity and baby goods. Like Returning Home: Owners of the Sundog Retreat are definitely not the smothering type we've encountered at some B&Bs. Our email confirmation notified us that we should just go directly to our cabin, which would be open and ready. A sign at the main gate offered a map to help us locate Fuzzy Crocus. Unless we decide to go to the main building for wifi or to hang out in the sunroom, we may never meet the innkeepers. There's no requirement to check out either. Just wash the dishes and leave the key on the table. Thankfully we do have a strong cellular signal at the cabin, which came as quite a surprise since we've encountered many "No Service" spots in the area. From the dock onto the plane and you're off! After lightening the background to capture the interior, our view looks like a painting.